This dress has come on holiday with me to Lanzarote and now to Portugal, I was in need of a good location to blog it and a lot of sun for it to stand out. Ideally I would have blogged this in the evening by the sea but, I don't live by the sea and the few days I was there I didn't get a chance to. I won't deny that this dress is far too short, especially for someone as tall as me but I love that it's neon so I'm thinking of getting it cut into a peplum style top instead (it was far too pretty to return). 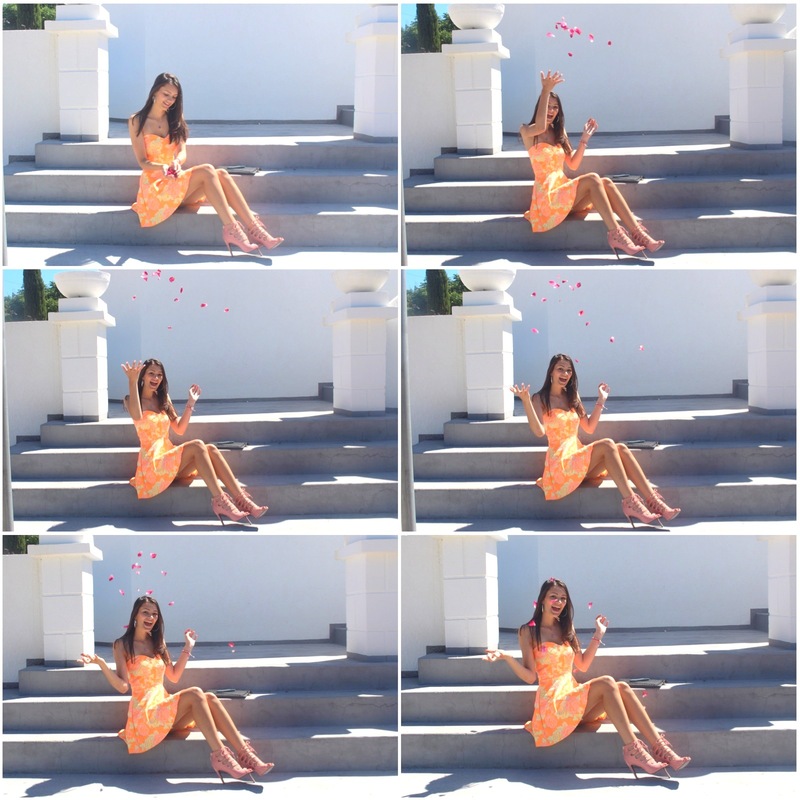 I got excited and tried really hard to get some pictures throwing petals in the air and so locked my face in one position, hello try-hard face haha. Why does this always happen to me?! I try so hard to get some natural looking photos and end up looking ridiculously staged. I've loved experimenting with colour this summer, here I'm pairing neon orange with coral pink; I love the idea of colour blocking and while the sun is shining why not, soon the weather in London will mean I'll be dressed in black and grey most days so better make the most of it! These are my favourite heels, I think they're such an edgy shoe even though they're a girly pink - the perfect mix in my opinion. I wore simple silver jewellery, including this beautiful Swarovski necklace. When wearing a bandeau, simple jewellery compliments the skin so perfectly, I love this subtle detail. Have you been experimenting with colours this summer? this dress is beautiful and love the colour combo! you look so so stunning! I am loving that dress, so cute! !